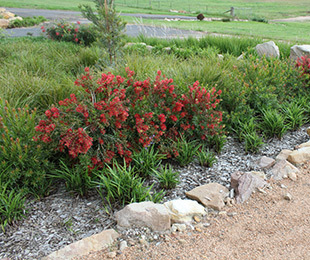 real feature and flowers will often appear in autumn as it repeat flowers in certain regions of Australia. Unlike many prolific flowering Callistemons, the Flora Burst™ plant is relatively self cleaning, leaving far less seed pods on the plant after flowering. 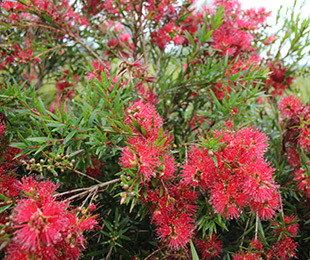 Flora Burst™ Callistemon has beautiful rustic red new growth in spring and autumn. Size: 2m high x 1.5m wide. Uses: Hedges, mass plantings and feature plantings. Position: Full sun to light shade.Works in most soil types. Care: Water as required for 8-13 weeks until established. Plant in a well mulched garden (chunky mulch is recommended). If required use slow release fertiliser in spring. responds very well to pruning at different times of the year. Pruning is beneficial as it will encourage dense, bushy growth. Where it works: NSW, ACT, VIC, TAS, SA, WA, QLD & NT.